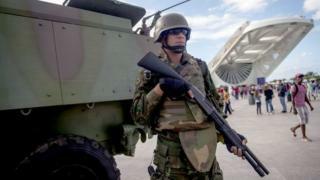 Is Rio de Janeiro a city at war? This time last year, Rio de Janeiro was winding down from the euphoria of the Olympic Games. Despite the city's violent reputation, much had been done to make Rio live up to its nickname, Marvellous City. Money was poured into the city's favelas through projects such as Police Pacification (UPP). This put a police presence in the slum areas to try to wrest control from drug gangs. But the investments have widely been seen as a failure. Rio is facing challenges on several fronts. Former Mayor Eduardo Paes is being investigated for allegedly taking millions of dollars in bribes for Olympic Games contracts. And last year, Rio state declared a state of financial emergency. There are frequent criticisms that there is not even money to pay for the petrol in police patrol cars. The crisis in Rio is having deadly consequences. A police officer is killed on average every 54 hours in Rio state. According to the state's security secretariat, nearly 3,500 people were murdered in the first six months of this year, 15% more than last year. The number of people killed by police in shootouts rose by 45%. Every day, there are new headlines splashed across the papers reporting the growing violence. Jornal Extra has even created a pullout war section that its journalists say is needed to be able to cover the stories. Thousands of soldiers have been deployed on the streets in recent weeks, a show of force perhaps but not everyone is convinced they will make a difference. "Things are out of control here," says Marcio Jorge, who works in a supermarket on Copacabana. "We don't even want to leave the house because we don't feel safe. In my neighbourhood yesterday eight vehicles were robbed and now the crossfire can be heard everywhere, not only in the favelas. Insecurity is everywhere." Amid the violence, Dennis Coli and three of his friends came up with a bright idea. They developed an app called OTT (Onde Tem Tiroteio, or Where There Are Shootouts). It informs people about violence in the city. OTT has reliable sources in favelas and across the city. When they hear of a shootout or a police operation, they ask their contacts to confirm it, all within two minutes, so they can alert their followers on their app, or on Facebook, Twitter and Instagram. "We had to do something because the government wasn't doing anything," Mr Coli says. "Nobody knows how many shootings are happening, how many robberies are happening and we are showing this. We're exposing the violence in Rio at this point in time." Cecilia Oliveira, with the help of Amnesty International, works on another app called Fogo Cruzado (Crossfire). She is so overworked, she is having to hire more people to cover all the shootings in the city. And she does not think it will get any better any time soon. "It's a hard situation and to add to this, there is a new gang that used to work in Sao Paulo coming to Rio - we have a lot of guns on the streets," she says. She thinks Rio's financial problems are exacerbating things: "How do you resolve this situation if you are not paying the police? It's hard to think of a solution in this scenario." But one former police commander, Ibis Pereira, says Rio's problem lies in bad government policies towards tackling violence. "When a Brazilian dies every nine minutes, when 10% of the homicides in the world happen here, there is something deeply wrong," he says. "Despite being one of the largest economies in the world, there is a brutal inequality. Historically, we've tried to solve the problem of violence - especially in the poorest areas - exclusively with police." Not enough has been done to make the poorer parts of the city safer places to live in, he says. It is a feeling echoed by many. Innocent families get caught up in this violence in unimaginable ways. Brazilian daily O Globo reported that last Friday morning nearly 20,000 students were unable to go to school because schools and crèches were closed in areas of high risk. But the story that shocked everybody in Rio was that of Claudineia dos Santos Melo and her baby Arthur. She was days away from giving birth in June when she was hit in the stomach. The bullet also hit her baby. Little Arthur was delivered by emergency Caesarean and remained in critical condition. But earlier this month, he died. Claudineia and her partner Klebson da Silva held a funeral for him when they should have been enjoying the first weeks of parenthood. Arthur was the youngest victim of Rio's violence.